CHARLOTTESVILLE, Va. (Reuters) - Prosecutors in the murder trial of a white nationalist said on Thursday the defendant was motivated by hatred when he drove his car into crowd of counterprotesters last year, while the defense argued that he was fearfully reacting to a violent environment. 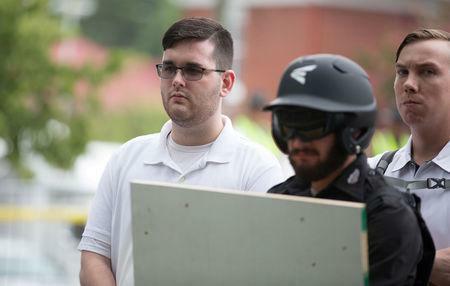 Asking a Virginia jury to find James Fields guilty of murder and nine other charges, prosecutor Nina-Alice Antony said the 21-year-old defendant had no reason to be fearful, and that he came to the rally from Ohio intending to harm others. Fields could get a life sentence if found guilty of the murder charge. "At the end of the day, it comes down to his intent,” Antony said, summing up her case in the Charlottesville Circuit Courtroom after jurors had heard a week of testimony. She cited evidence presented earlier that Fields had exchanged cellphone text messages with his mother suggesting the counterprotesters would "need to be careful," and sent her an image of Adolf Hitler. Defense attorneys never disputed that Fields was behind the wheel of the Dodge Charger that sent bodies flying when it crashed into a crowd on Aug. 12, 2017, killing counterprotester Heather Heyer, 32, and injuring 19 others. Instead, they suggested he was intimidated by a hostile crowd and acted in self defense. "James' actions were impacted by everything else that was going on,” defense attorney Denise Lunsford told the jury in her closing arguments. Fields, who did not testify in his defense, was one of hundreds of white nationalists who descended on Charlottesville for a weekend protest against the planned removal from a public park of a statue honoring the U.S. Civil War-era Confederacy. The rally also drew counterprotesters. Defense attorneys had put on testimony from other attendees of the "Unite the Right" rally who said they had been threatened and seen others pepper-sprayed by the counterprotesters. Also testifying was Dwayne Dixon, a member of the left-wing group Redneck Revolt, who said that with an AR-15 rifle over his shoulder, he told Fields to leave the area about 30 to 60 minutes before the fatal car-ramming incident two blocks away. After his arrest, Fields broke down in tears at the police station upon learning he had killed someone, according to video shown to the jury.